That's Another Story: Learning from Picture Books – TO THE STARS! I am super excited to share this one with you. 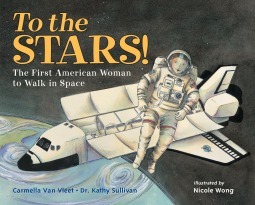 It’s written by one of my writing friends, Carmella Van Vleet, and I know a little bit about all the hard work Carmella and Dr. Kathy Sullivan put in to tell the story of the first American woman to walk in space! Kathy Sullivan wanted to go everywhere. She wanted to explore and do exciting things that girls weren't supposed to be able to do. She liked fishing and swimming; flying planes and studying science. That's what she liked and that's what she decided to do with her life. She eventually became a NASA astronaut and the first woman to walk in space. Kathy wanted to see the whole world and so she did: from space! Backmatter includes further information about Dr. Sullivan and her career, as well as other famous firsts made by women astronauts. To the Stars! The First American Woman to Walk in Space was written by Carmella Van Vleet and Dr. Kathy Sullivan, and illustrated by Nicole Wong. It was published by Charlesbridge in 2016. This book has a unique structure. The story scenes alternate between Kathy’s interests as a child to her interests and accomplishments as an adult, so it is possible to see the parallels. I’ve never seen a picture book written this way before, but I think it’s effective in moving the story forward. Along with the illustrations that clearly show Kathy as a young child and grown woman, changes in font style help to reduce confusions. This is good book to read to promote the role of women in science, and to show children of any gender that they can accomplish what they dream about. I really liked the way different areas of science and scientific tools are included in the story – there is a lot to talk about here, including blueprints, compasses, instrument panel, undersea exploration, flying, and of course, being an astronaut! Because of the way the book is laid out, it would be fun to encourage readers try to predict from Kathy’s interest or adventures as a child what adult activity or job it connects to on the following page. What do you dream about doing when you are older? Draw and picture and write about your dream. It would be fun to seal up your picture in an envelope to open in ten years! What jobs do the women in your life do? Make a list. Are there any jobs women can’t do? Why or why not? There is an extensive educator’s guide with ideas for many different curricular areas. Oh, I like this story. What a great role model for girls. Dream big. Will check it out! Love the book and illustration on the cover. The layout you mentioned sounds interesting. Must check this out. Thanks.